A well appointed spacious and modern apartment located at first floor level in a small quiet apartment complex. Close to the sea front and in a superb central location. 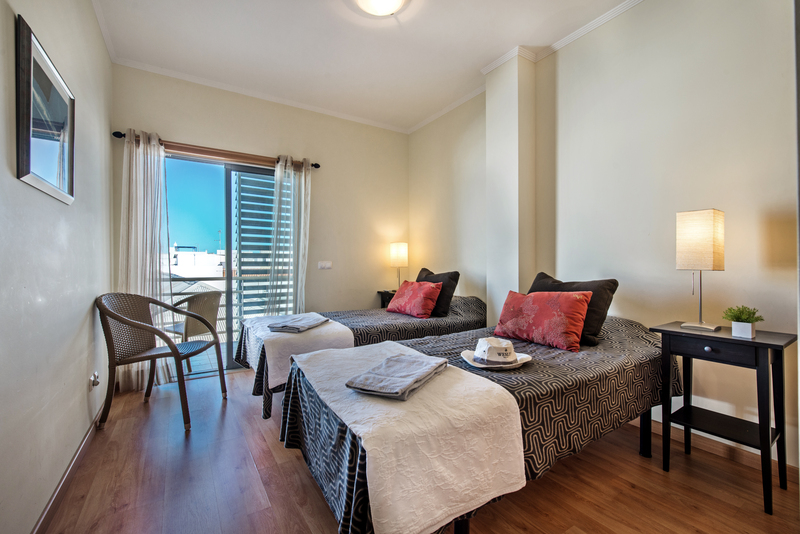 Offers great facilities including air conditioning and excellent WIFI. 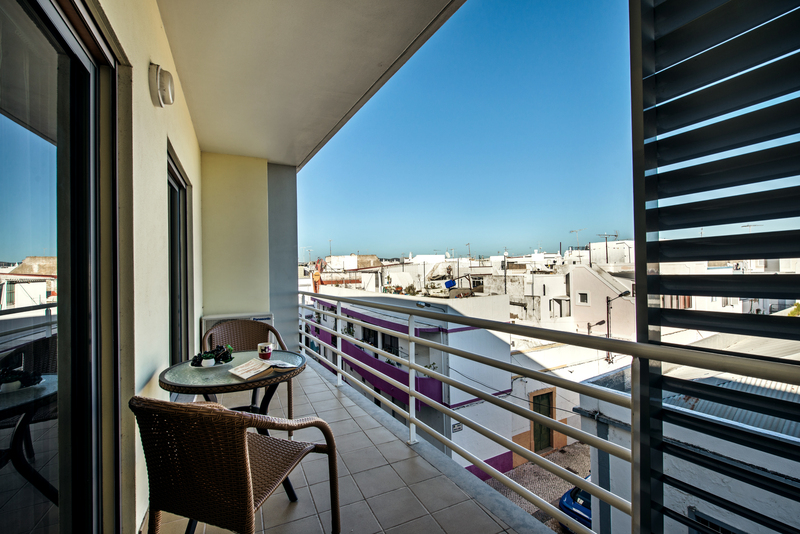 Apartment Pescador is a first rate 2 bedroom apartment and is a perfectly located holiday home for those who do not wish to hire a car. Situated at first floor level on a small apartment complex in a quiet street in Olhao but close enough to the town to have all you could need within very easy walking distance. This wonderful 2 bedroom apartment is set within a small complex of apartments no more than 3 storeys high. From the quiet side street a few steps or ramp leads up to the front door the the complex of apartments. Access is via an intercom system and guests have a key for the main front door that opens into a vestibule area used to access the various apartment's in the block. Either internal stairs or a lift give access to the upper floors. 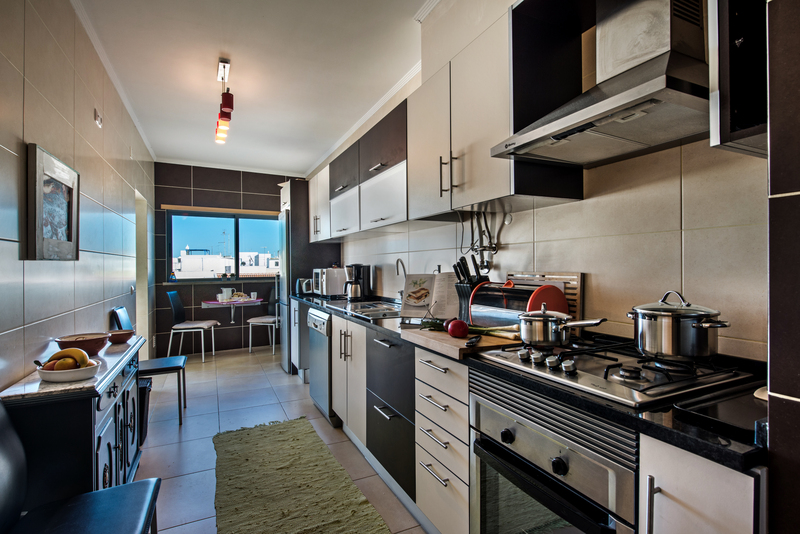 Our 2 bedroom apartment is located on the 1st floor. From the lift Apartment Pescador is the first apartment on the left. A solid and modern wooden door with a 5 lever lock opens in to a small room that in turn gives access to the rest of the apartment. 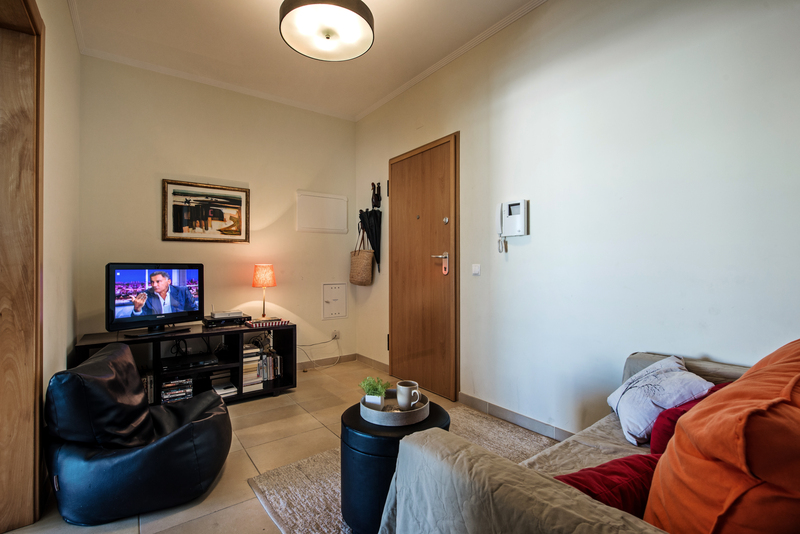 As soon as you enter the 2 bedroom apartment the door opens into a small room where you will find a small comfortable sofa along with a super bean bag to enjoy facing a tv unit stuffed with books and magazines and sitting on top a large flat screen Smart television. We have provided a selections of European tv channels to suit various Nationalities. Also by the tv is the WIFI box that provides internet throughout the 2 bedroom apartment. This room makes a great area to sit and enjoy the television away from the main front room and give wonderful flexibility for guests. Double light wood and smoked glass doors open into a large living and dining area. To the right of the doors and to the rear of the room is a modern dark wood table and 4 dark wood chairs with suede effect seat cushions. A large standard lamp throws light on to the dining table and area. Cream walls and light ceramic floor tiles give a light and modern feel to the room. A pair of large cream fabric sofas face each other and in the centre of the room is a large dark wood coffee table that matches the dining suite. The mix in colours offers great contrast to the living space. As you enter the living space on the left is an old antique sideboard with a traditional marble top, reminding you of the historic and old town of Olhao that is steeped in fishing history of times gone by. At the front of the generous living space is lovely large double french sliding double glazed windows giving access to a private terrace overlooking the city centre. 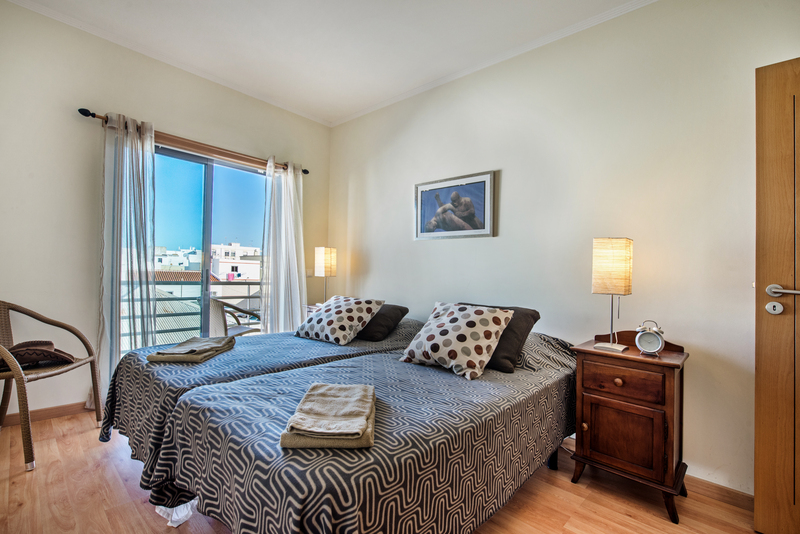 The windows have the added extra of shutters that can be open to allow in the natural light and sunshine whist you are home but closed during the day whilst you are out enjoying the beaches and Town to keep the apartment dark and cool for your return. The living room benefits from efficient air conditioning that can supply lovely cool air in the hot summer months. This modern unit can also provide warmth in the cooler months so our 2 bedroom apartment makes for a great holiday base any time of the year. 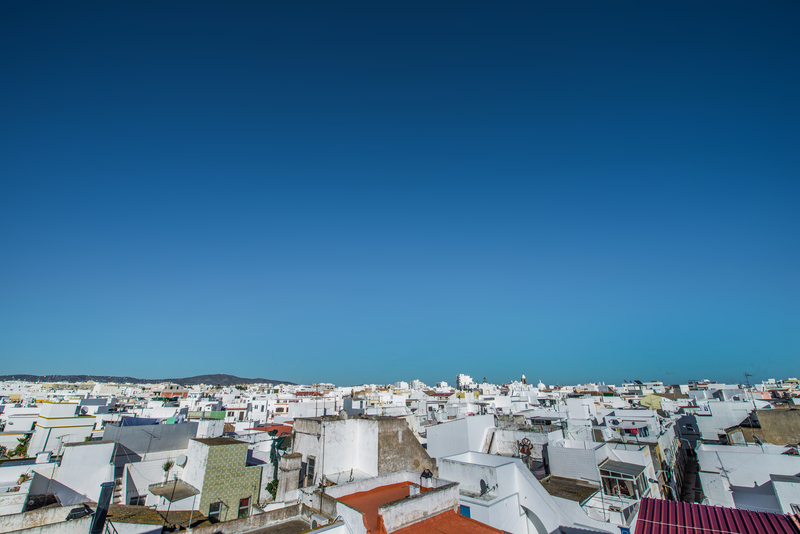 The Algarve can be a wonderful place to visit during the Winter months for the warmer climate. From the television area a long hallway runs the length of the apartment and allows access to each room. 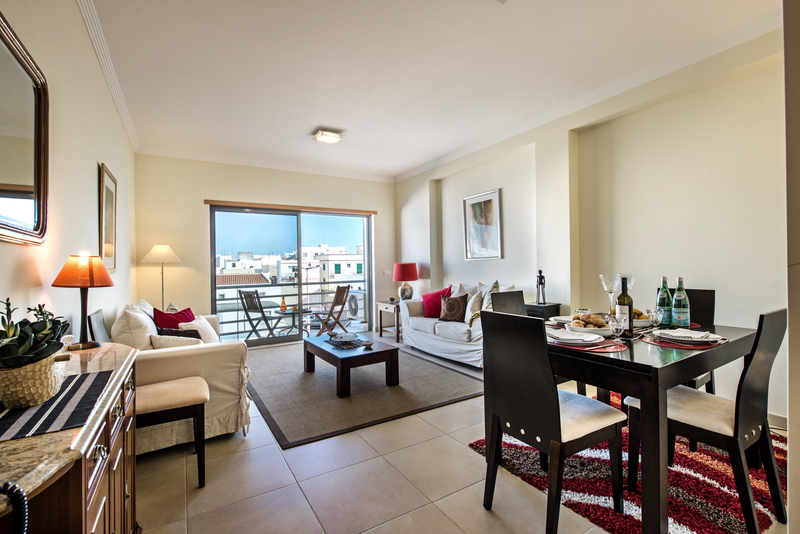 This 2 bedroom apartment benefits from an exceptionally well equipped and full size kitchen. As you enter the kitchen along the right wall is a fantastic selection of fitted kitchen units at both floor and eye level. A mix of black, white a smoked glass fronts provide e very modern feel. In the cupboards you will find a splendid supply of kitchen items, including pots, pans, frying pans, dishes, serving dishes, cooking utensils, crockery, cutlery and a wide selection of drinking glasses. We make sure you have a little washing up liquid, hand soap and tea towels to get you started. The integrated appliances include a 4 ring gas hob set into the work surface with a large inox extractor fan above and a full size integrated electric oven below. Black marble work surfaces compliment the large cream tiles decorating the kitchen serving as a stylish but practical solution. A large fridge freezer and dishwasher can be found integrated in to the kitchen units and on the surface we have placed a capsule coffee machine, kettle and toaster. On the left of the kitchen is anther antique sideboard with an old fashioned marble top and at the end of the kitchen looking out to the street below is a folding table and 2 chairs. This makes a great breakfast spot or just somewhere to sit watching the cook at work! By the table on the left is a door that leads on to a private terrace thats also has access from the master bedroom. 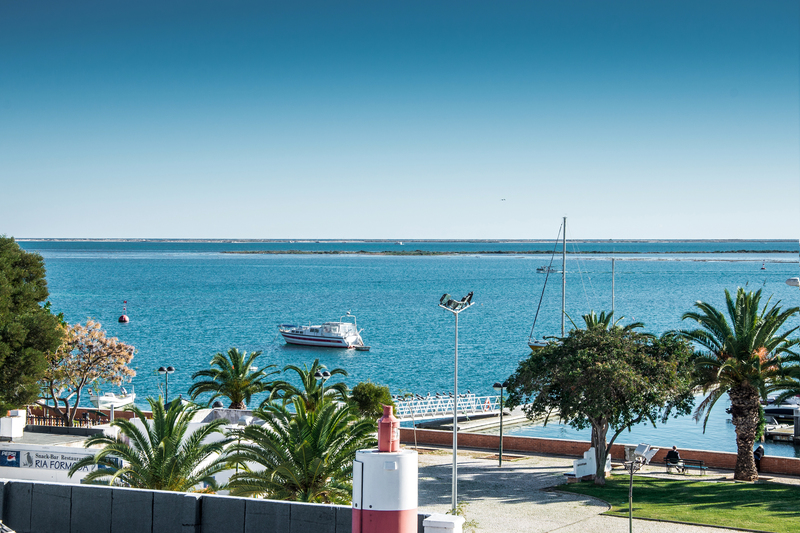 Olhao is famous for its locally caught fish and the daily market provides a massive selection of sea fish and sea food to choose from at wonderfully low prices. This along with the local produce market with fruit and vegetable stalls and as well butchers provides almost everything you need to enjoy a wonderful cooking experience. In the hallway between the bedrooms is a utility room with a washing machine and a sections of cleaning tools. You will also find and iron and ironing board. The first bedroom in our 2 bedroom apartment has 2 single beds that are pushed together but made up as single beds. Each side is a wooden beside cupboard both with lamps. We have provided lovely fresh crisp white bed linen along with white bath and hand towels and beach towels for your use. Laminate flooring offers a sense of comfort to the bedroom. Huge sliding french windows let in an abundance of natural light but have the facility of shutters that can be brought down to make the room ice and dark at night but kept down will help keep the room cool during the day in the hot summer season. Lovely white flowing curtains add a touch of softness to the bedroom. The windows give access to the private terrace from the kitchen and looks down over the quiet side street below and over some of the wonderful Olhao rooftops. An air conditioning unit offers that all important cool air or warm air depending on the time of year. Between the bedrooms on the opposite side of the hall is a cloakroom, tiled with a mix of large cream tiles and rich chocolate brown mosaic tiles. The room offers a sink in white ceramic set into a light wood floating unit with a beautiful large mirror above and a toilet. The second bedroom in our 2 bedroom town centre apartment has twin single beds each with a dark wood bedside tables and modern lamps. The laminate floor offers a touch of comfort under foot and the air conditioning unit provides ultimate comfort with super fresh cool air in the summer and cosy warm air in the winter. This bedroom also has wonderful huge french windows that lead to another private terrace. 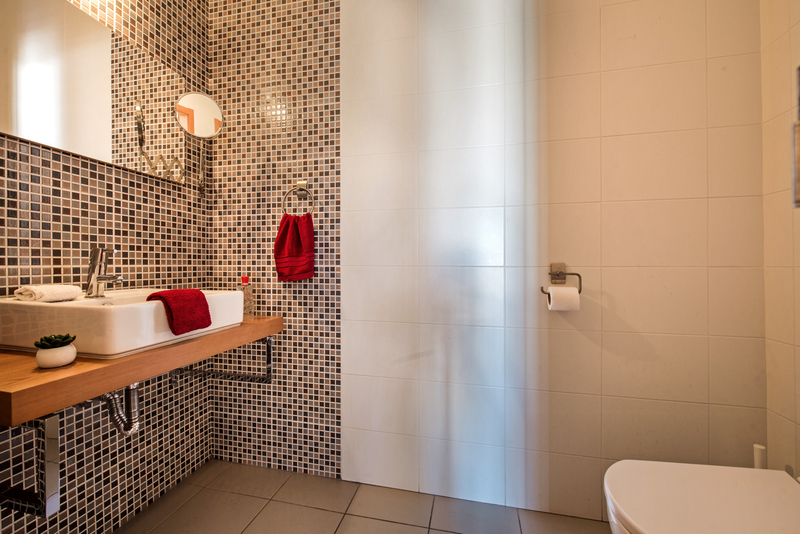 Next to the second bedroom is a superb family bathroom with a full size bath and over head shower. A toilet and a basin set into a dark wood vanity cupboard. 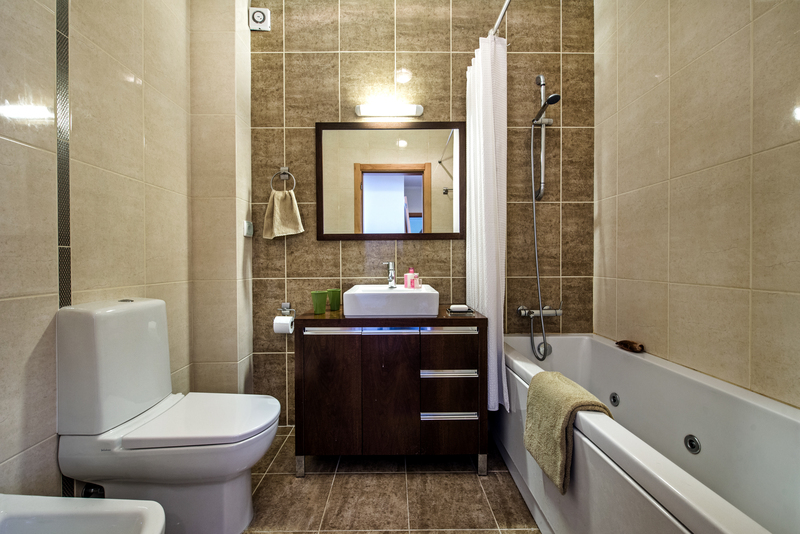 Above is a super large mirror and the bathroom is decorated in a modern and warm chocolate theme. The suite is modern and white and very stylish. 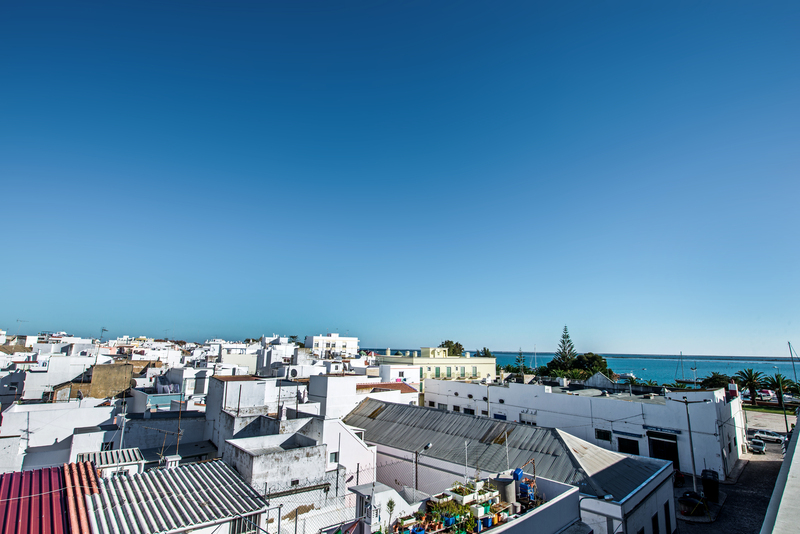 Three private terraces run the length of our 2 bedroom apartment and offer fabulous paces to sit and enjoy the atmosphere os+f a town centre location in an wonderful old fishing town now popular for tourists, artists and many Nationalities choosing to liver here. You can look down onto the street below and enjoy watching people go about their daily business. Across the street is a famous square that leads into the small cobbled streets giving access to old merchants houses and fisherman's cottages. 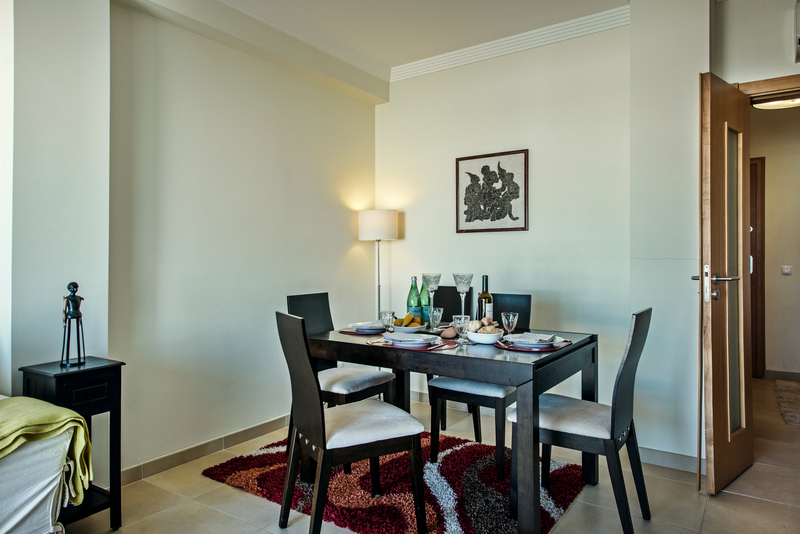 Each terrace offers a table and chairs for your comfort and you will find terraces from the living room, kitchen and bedrooms. 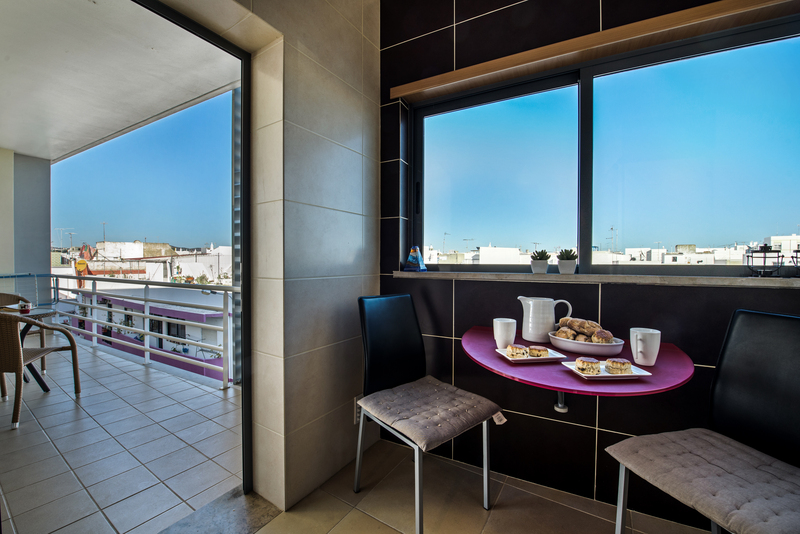 They are well placed to watch the wonderful sunrises the Algarve offers up every morning. Apartment Pescador does have access to an underground car park, but please do ask if you wish to use this facility. From the garage internal access to the 2 bedroom apartment is possible by either lift or stairs. 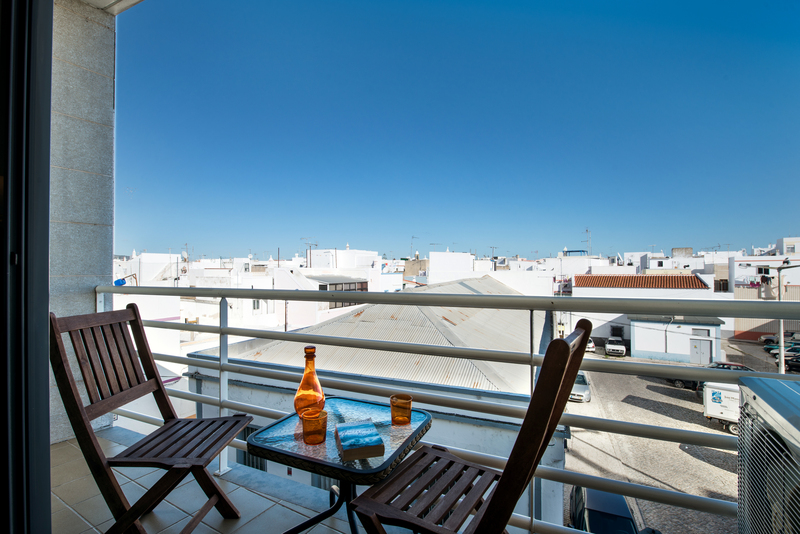 Our 2 bedroom apartment also has access to a huge shared roof terrace. This makes a great place to sit and sunbathe and moreover enjoy the stunning sea views being so close to the sea front. This 2 bedroom apartment sits in a marvellous location within the town centre of Olhao. Just 30 second walk for the sea front gardens and Marina. Along with a 5 minute walk to the daily markets shops, amazing restaurants and cafes. Both the train and bus station are nearby so there is no need to hire a car. This 2 bedroom apartment give you the chance to enjoy authentic and local life but with modern comforts, including wifi and air conditioning. 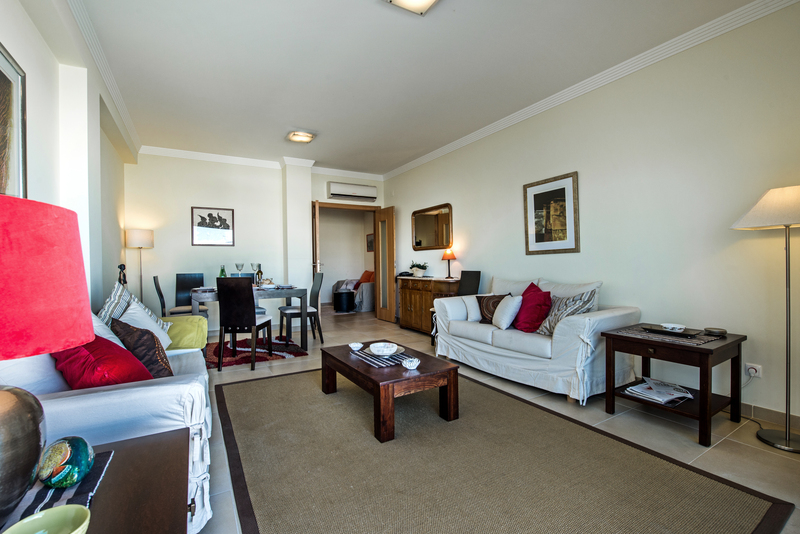 Our lovely 2 bedroom apartment comes with its own manual that you can download to your tablet or smart phone. Packed full of information to make the best of your holiday starting from the moment you arrive. It tells you how to collect the keys, who will look after you during your stay and clear concise directions to Apartment Pescador. Then it is packed full with details of the best restaurants, taxis and local amenities and activities. "We really liked it. We like to come back. The Location is perfect. Short Distances to everything. All super clean. We recommend the Accommodation in any Case." We had a very enjoyable time thank you and found the apartment to be in a great location, well-appointed and very clean. Lovely morning sunlight too. We will certainly look to use your services again in future. It was a very pleasant stay and the house is very nice with everything you need. The area is lively with plenty of good restarants. We enjoyed the terrace, or we did a BBQ on a regular basis. Thanks for everything and I keep your site for a next holiday in the Algarve. Samantha and Simon were very quick to email us with any questions we had. The apartment was lovely and clean and very close to the ocean and Main Street. You can walk every where in Olhao. We had a great stay in this apartment, clean, had everything we could desire. Very close to all restaurants, shops, cafes, bars, market etc. The Saturday farmers market is great for veg and fruit. You can even watch the odd football game in one of the bars on the front. Olhao is simply very good value for money in every way. The property is very very nice and has the lot. Balcony for drinks and watch the world go by. Booked direct with Mars, they were very helpful and organised. Thanks to Sam and Hanna for the welcome.